When leadership finds you, make it about improving your own teaching skills as well as helping others connect with new ideas, tools, and materials. When my principal asked me to lead a team of social studies teachers at my school, I hesitated. It's not my natural instinct to be in charge. Although I started teaching at age 15 at a local day care center, I'm only in my fourth year at Middle School 354, the School of Integrated Learning, in Crown Heights, Brooklyn. Who am I to tell another teacher with 10 or 20 years experience what to do? I'm keenly aware that my principal is taking a chance on my leadership and presenting me with an opportunity. Like many schools, MS 354 is in the midst of change. We're still adjusting to new standards and the EngageNY course curriculum. About a year and a half ago, we were also introduced to the Literacy Design Collaborative (LDC), a network of educators who use a common system to create literacy-rich assignments and lessons in subject areas. In the middle of these shifts, our district mandated that we consolidate with another middle school in our building, MS 334. Both schools serve a diverse group of students, many of whom enter below grade level. These changes have been rapid. Within a year, I've gone from being a social studies department of one to leading a team of new teachers. It's challenging at times, but I'm quickly learning so much about teacher leadership. When I previously assigned document-based questions (DBQs), I would ask students to read and analyze documents on a topic and then write a few drafts of their response. Now, with the LDC tools, I break down each step and teach students skills along the way, such as annotating a text or note taking. I'm seeing my students write at a deeper level and apply their new skills to other tasks, like using note-taking strategies in their notebooks. The new tools help me do what I was already doing -- but do it better. It wouldn't have happened, though, if I hadn't given them a try. The EngageNY curriculum provides the social studies standards and content, such as the Agricultural Revolution and American Imperialism units. Within these units, we use the LDC tools to refine assignments. We reword prompts so that they don't lead students to "yes/no" responses. We also identify certain requirements in the prompt -- instead of asking students to just "argue," we name the specific demand, such as analyze, evaluate, or compare. Students are clearer about what the assignment is asking and learn different approaches to writing about the content. From this, I've learned that good leadership connects seemingly different strategies and materials in ways that make sense for the classroom. By doing so, we work to avoid the "pile on" of strategies that overwhelms teachers and students. As our school consolidates with MS 334, all teachers are bringing their own experiences and feelings about the changes. My principal expects that I'll help acclimate the social studies teachers to our school and build a cohesive department. I started our department conversations by emphasizing our common goal: helping students. I then introduced the LDC tools as one way to help students improve their literacy skills and, through that, their social studies content knowledge. Although it was a bumpy start, little by little, our new department gave it a try. Now, we've decided as a team to use LDC to organize and discuss our teaching. A teacher recently mentioned that she was concerned about the level of student work on a particular assignment. Using the LDC tools, we looked at the student papers and classroom lessons, and we realized that students didn't analyze the rubric. 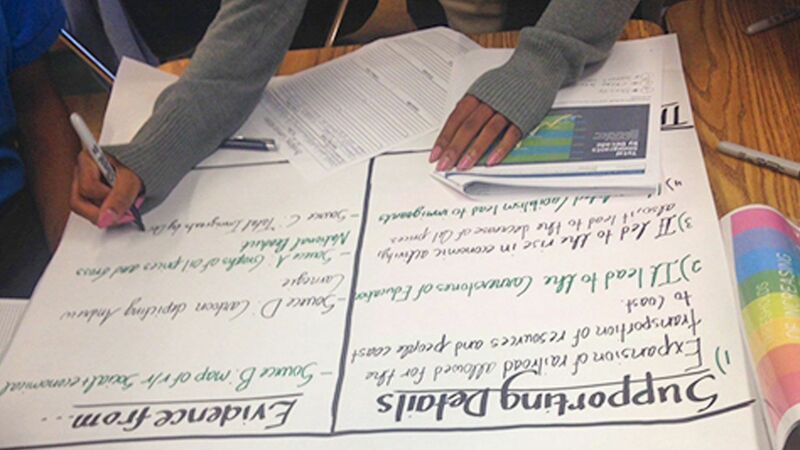 Reviewing a rubric isn't necessarily a lesson that all students need. However, it was clear that these particular students didn't know how to unpack the rubric and, because of that, didn't understand what was expected of them. By using a system to look at lessons and student work, the teacher and I were both comfortable in knowing that our conversation wasn't personal. We were problem solving together to help students. Here's the overall lesson that I've learned about leadership. It's not about me telling people what to do. It's about all of us learning together. Are you a teacher in a leadership position? What lessons have you learned through the experience? Please share them in the comments section of this post.